FYI Guy: At the beginning of this decade, there were more homes in Seattle with nine or more rooms than with one. Location vs. size. It’s the trade-off that every budget-conscious apartment hunter has to consider. Census data released this past month included this remarkable statistic: In 2017, for the first time, one-room units made up a bit more than 10 percent of Seattle’s total housing stock. 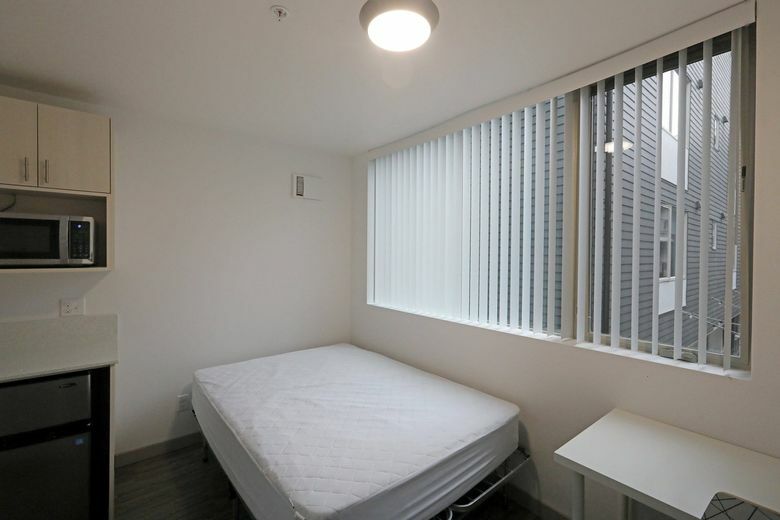 To be clear, it’s not just one in 10 apartments that are a single room. The data show it’s 10 percent of all housing units in the city, including single-family homes, town houses, condos and so on. The number of one-room units, which now stands at about 37,000, has gone up nearly 80 percent since the start of the decade. Back in 2010, there were more Seattle homes with nine or more rooms than with one. That’s no longer the case. Many are your standard studio apartments, often around 450 or 500 square feet. Increasingly, though, new units are even smaller than that — often much smaller. In Seattle, a city with a knack for acronyms, they’re officially known as SEDUs: Small efficiency dwelling units. Most people call them micro units, or just shoe-box apartments. Whatever you call them, they’re changing the way a lot of folks in Seattle live. Since 2010, 88 multifamily buildings with an average unit size of less than 400 square feet have been built, or are under construction, in the city of Seattle, according to the commercial real-estate data firm CoStar. The majority of them have gone up in the past couple years, and the highest concentration is on Capitol Hill, which has almost a quarter of the total. But you can find these buildings all over Seattle, at least in the areas where zoning allows for them. They allow folks on a tight budget to rent, sans roommates, in some of the city’s most desirable neighborhoods. Even though the cost per square foot on micr0 units is typically higher than on larger apartments, they’re so small that the rent stays relatively low. Many are around the $1,000 mark, although it’s not hard to find units with a significantly higher price tag. Some have amenities you would associate with a luxury building — rooftop lounges, gyms, dog-wash stations. But they’re cramped. The most micro of the micro among these new buildings is the aPodment Suites at Riano in Ballard, which opened earlier this year. 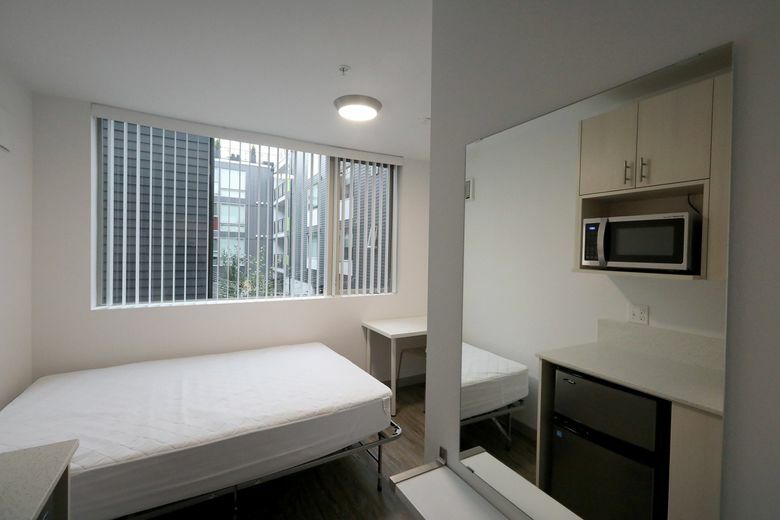 All 74 units are 160 square feet, according to CoStar. Have you started to lose track of all the ways we’re becoming just like San Francisco? Me too — but this is another. Seattle and San Francisco are the only two U.S. cities, among the 50 largest, where more than 10 percent of units are a single room. It happened in San Francisco first, and one-room homes now make up nearly 14 percent of the total in the City by the Bay. They are much rarer in a lot of other cities, particularly places where most people live in houses and rents aren’t anywhere near as high as Seattle. At the other end of the spectrum from San Francisco and us is Virginia Beach, Virginia — only about one in 100 housing units are one room. 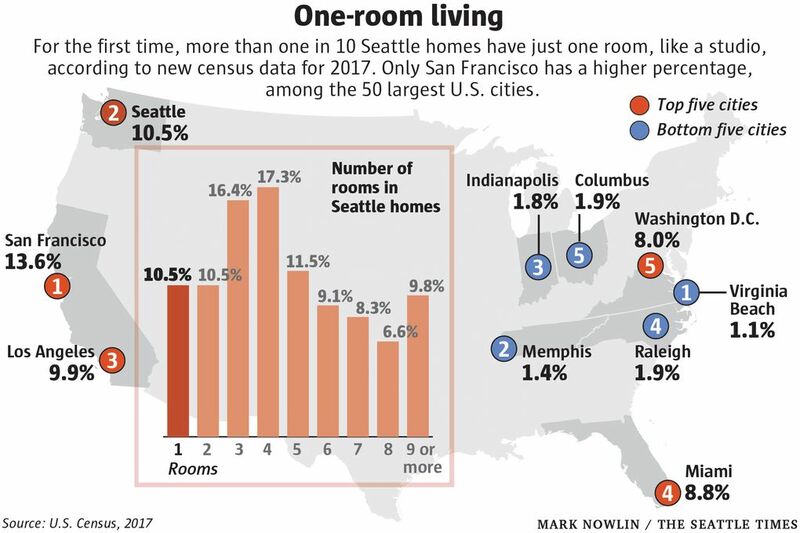 The distribution of Seattle homes by the number of rooms is quite evenly spread out, but four rooms is the most common — there are more than 60,000 homes with four rooms. That could be, for example, a home with two bedrooms, a living room and a kitchen (bathrooms don’t count as rooms in census surveys, nor do foyers, hallways, alcoves, porches, unfinished basements and attics, and so on). Three-room units are a close second, at about 58,000. Not surprisingly, more than three out of four one-room units are rentals. In case you’re wondering, dormitories don’t count toward the number of one-room homes, because they’re not considered housing units in Census Bureau terminology. Dorms are classified as group quarters, along with military barracks, skilled nursing facilities, prisons and so forth. About 21,000 Seattleites live in group quarters. Living in a single room can’t be the solution to Seattle’s high rents for everyone. It certainly isn’t suitable for a family, or even a couple. But for a young, single person, it can work out well. And in Seattle, there are a lot of them. In 2017, census data show that 162,000 Seattleites — more than a fifth of the city’s population — were never-married singles between the ages of 20 and 34.